ARC Office Systems Ltd was formed in 1994 to provide a comprehensive service for all office equipment needs. Our service is second to none in supplying, maintaining and supporting multifunctional devices and information technology products nationwide. Since our inception we have enjoyed rapid growth due to our ability to offer extremely high levels of support in all areas of our business. Our expertise in technical hardware, software and computer networking certainly sets us apart from our competitors. Most of our new business comes via recommendation from existing customers, which speaks for itself. 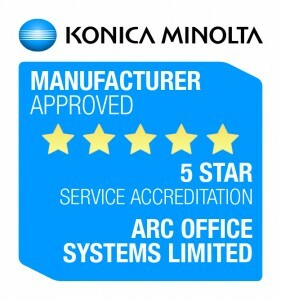 In 2000 we were approached by Konica Minolta to be an approved supplier of their comprehensive range of multifunctional devices. This partnership has also helped us develop our expertise in the very exciting document solutions market place. These machines represent the future due to their huge flexibility. Whether stand alone or networked into your computer environment, they can add immense value to your business. We pride ourselves on being extremely competitive both in the supply of new products and fully comprehensive service packages. We look forward to supplying you with a bespoke solution to your requirements that addresses your current and future needs, and to a long and fruitful business relationship.